New York Times bestselling author and renowned leadership consultant Chester Elton shares insights from his book “The Orange Revolution” on how to build high-performance teams. 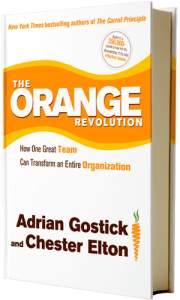 In his book “the Orange Revolution”, New York Times bestselling author and renowned leadership consultant Chester Elton, and his co-author Adrian Gostick, provide a groundbreaking research that reveals that true driver of exceptional success is a particular breed of breakthrough team that generates its own momentum. In this conversation with Chester, he shares insights from his book on the characteristics of breakthrough teams, how they operate, and what project leaders can do to transform their own teams into such high performers. Chester’s books have been translated into over 20 languages and have sold more than a million copies worldwide. 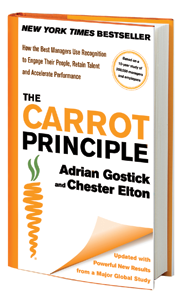 The Carrot Principle by Simon & Schuster has been a regular New York Times and Wall Street Journal bestseller, and 24-Carrot Manager has been called a “must read for modern-day managers” by Larry King of CNN. The Orange Revolution was the number one selling business book in the United States according to the Wall Street Journal. As a motivation expert, Chester has been featured in The Financial Times, Washington Post, Fast Company, and the New York Times. He has also been featured on 60 Minutes, CNN, ABC’s Money Matters, MSNBC, and National Public Radio. You are called the “apostle of appreciation”. How did you get this title and what drives you to help leaders understand the importance of appreciation in exercising leadership? As you engage your clients and readers, you must encounter firsthand the power of breakthrough teams. Can you share with us your favorite example that best illustrates the power of breakthrough teams? You will be presenting at Pink Elephant’s 17th Annual International IT Service Management Conference and Exhibition February 17-20 in Las Vegas. You will talk about How one great team can transform an entire organization. What are some of the key questions you will address in your presentation that project leaders should not miss? You will talk about the “Orange Revolution”, which is also the title of you the book. 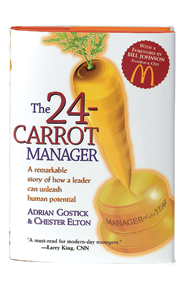 How does this book connect with the other books “The Carrot Principle”, “The 24 Carrot Manager”? Can you give us a high level overview on the “Orange Revolution” framework you describe in the book? One of the aspects that make this model very interesting to me is the independent research that went into forming the basis for the model. Talk a little bit about this research and why it was important for developing the model? 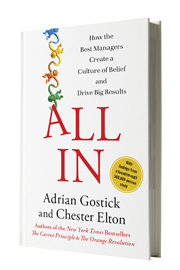 You latest book is “All In: how great managers create a culture of belief and drive big results”. 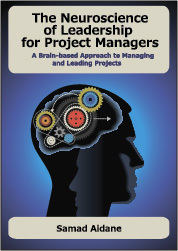 Can you talk about the core message from this book and how Project Managers will benefit from the insights you share in the book? What are some of the projects you are undertaking at the moment and what is next for you? Now in its 17th hugely successful year, this annual event is widely recognized as “the world’s best IT Service Management conference.” The program is content rich and comprehensive – 15 tracks, 160+ sessions – covering a vast array of subjects from all across the ITSM spectrum. There is something for everyone – strategic, tactical, operational.